Our modular panel design allows for interchangeable, replaceable powder coated panels. Modular panels allow for flexibility and ease of customization. – Our modular bolt together design allows for future extension of any line up of switchgear. – The modular panel design allows JAGG to 100% powder coat all switchgear structures prior to assembly. Powder coating with the use galvanneal metal allows for our equipment to exceed the ASTM B117 salt spray test. Contact JAGG today for more information on our Bolt Together Construction services. 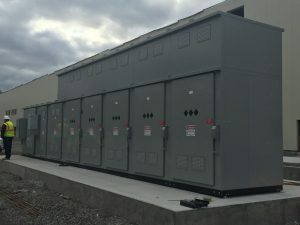 "Our vision is to provide the highest quality Medium Voltage Switchgear in the industry while simultaneously surpassing client expectations." © 2019 Jagg Electrical & Control.